The Amy Gillett Foundation congratulates the Tasmanian Government on the announcement that it will adopt a metre matters laws, made today at the Launceston Cycling Classic. Amy Gillett Foundation CEO, Phoebe Dunn, and Patron Simon Gillett joined the Minister for Infrastructure, the Hon Rene Hidding MP, at the announcement. “We are delighted that Tasmania has taken the important next step in protecting cyclists, by adopting a metre matters laws”, Ms Dunn said. “The Foundation has spearheaded the national effort on a metre matters laws because it will help save lives. A metre matters because it provides a practical measurement for drivers when overtaking bike riders”, she added. The announcement follows changes made in 2015 allowing drivers to cross solid centre lines to overtake cyclists when safe to do so, and a substantial education campaign highlighting the importance of giving cyclists more space. “Bicycle riders are some of the most physically vulnerable users of our roads. Amending the road rules to mandate a minimum overtaking distance will help reduce crashes between vehicles and bike riders by changing behaviour. We know from the experience in Queensland that the ‘one-metre rule is working,” Mr Gillett said. This announcement means that the entire east coast of Australia, with the stark exception of Victoria, has taken action in support of cycling safety. 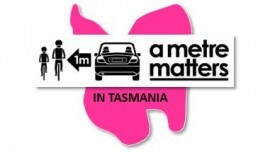 Tasmania joins Queensland and South Australia in adopting permanent a metre matters laws, with two year trials underway in the ACT and NSW. “This wonderful announcement by the Tasmanian Government highlights that Victoria is well and truly asleep at the wheel on cycling safety, despite recent research showing that the overwhelming majority of Victorians (9 out of 10) support the laws and a cross-bench parliamentary inquiry has recommended adoption of the laws”, Phoebe Dunn said. The Amy Gillett Foundation’s a metre matters campaign has the support of a broad range of organisations and road user groups across Australia, including Transport & Logistics giant Toll Holdings, partners Subaru, Europcar and Wiggle, motoring bodies including the NRMA and RACQ, research institutions, road trauma groups, health organisations, and cycling and triathlon groups. Tomorrow the Amy Gillett Foundation is delivering Cycling Safety Toolbox sessions at the Toll Depot in Launceston as part of its road safety partnership. “Toll is taking a leadership position on road and cycling safety, partnering with the Amy Gillett Foundation in educating its drivers on how to share the road with cyclists and supporting the Amy Gillett Foundation’s push for a metre matters laws. It’s now time for the Victorian Government to step up and do the same”, Phoebe Dunn said. “We look forward to working with the Tasmanian government on the implementation of these laws including a comprehensive education and awareness campaign, she added.